No year of liberated lotto blocks would be complete without this classic liberated star block. We’ll take our cue from Gwen Marston and call this month’s block the Variable Star. Our star blocks will be 9 1/2 inch squares (to finish at 9 inches in the winners’ quilts) in scrappy fabrics of the quilters choice with light backgrounds. Please use the label variable star for all posts about this month’s block and the label oct 2010 photos for those posts which include photos of your blocks. Because we are going completely scrappy this month, VALUE becomes the most important factor in your fabric choices and so, I’m putting fabric first. The BACKGROUND of your blocks could be a single fabric or a scrappy collection of fabrics, but it should be LIGHT. This doesn’t just mean relatively light, as compared with your star fabric(s)–if someone looks ONLY at your background fabric(s), they would say it was a LIGHT fabric (not medium). Similarly, you may use a single STAR fabric or as many as you like. They should have MEDIUM or DARK values. The EXCEPTION for STAR fabrics is that your star may have a LIGHT center, or a pieced center with light fabrics (including your background fabric). If you make multiple blocks–the usual maximum of 9 blocks applies–you may use the same background fabric(s) for all your blocks, but if your stars are predominately one fabric, please make unique choices for each block. I found three sources for directions for making this liberated style Variable Star block. Two are online. 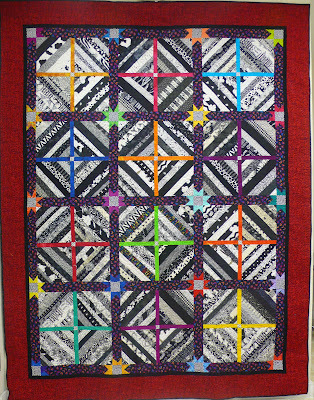 Gwen Marston’s book, Liberating Quilting, Process 8 – Variable Stars. 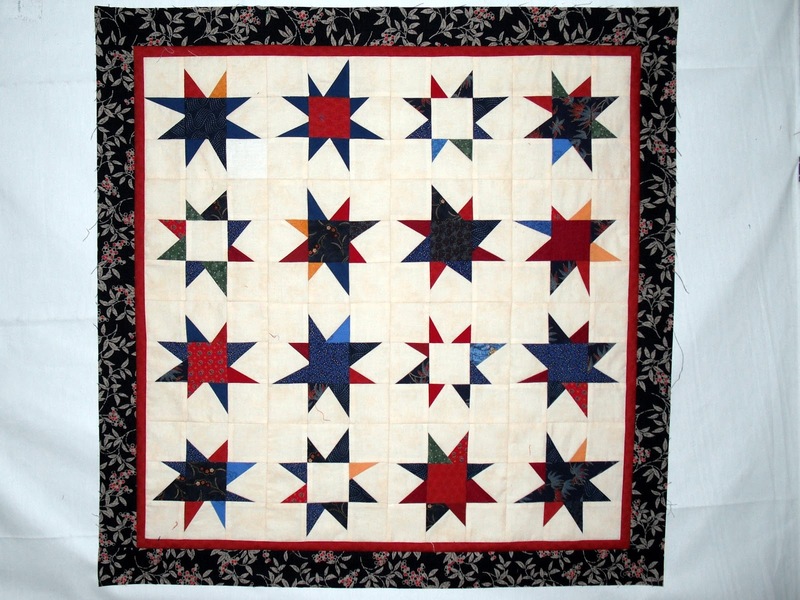 All these sources also have many beautiful examples quilts made from these star blocks–be sure to click (or flip) around while you’re there. Whether you use Victoria’s tutorial for making wonky stars, Bonnie’s directions for maverick stars or Gwen’s variable stars, the squares that you cut to begin should be 3 /12 inches. Victoria’s directions are for a 12 inch block; Bonnie’s directions are for a 6 inch block and Gwen’s directions are not size specific. Avoid framing too small blocks. Your block should be based on a 9 patch construction. If you’re worried your block will come out too small, start with slightly larger squares. Don’t forget that we are making 9 inch (finished size) blocks. Here are the blocks made by sneak peekers Ginny, Janet, Kim, Pat and Ramie. Click any of the individual blocks for a larger image. 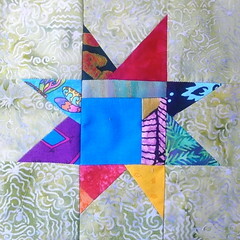 Patti’s blogged about her star-making class with Gwen Marston and has some nice examples of blocks and quilts, here. Kathleen is a member of the lib-quilters yahoo group and recently shared her Liberated Star quilt. She gave me permission to post it here. It’s a great example of how a simple setting can be very effective design. Kim, who made the block at the top and a couple others in the sneak peeker’s virtual quilt, shared her stars and stripes quilt with me. It’s a wonderful example of using these stars as a design element with other blocks–in her quilt below, the cornerstones are small variable stars. Both quilts are excellent examples of how important VALUE is to quilt design. Thanks to Kathleen and Kim for allowing me to share them. OOO, yes! I do like this one, Sophie, and hope to participate this month! And, I love what Kim did with them. I LOVE this month's blocks. The black star that uses a half-square triangle is really intriguing as is the one that looks like a star in a cross. October is going to be very exciting! Sophie – I was doing so good not over committing myself these last few months, then you had to decide to do MY FAVORITE block. arg. I'm going to have to find time to make these! Does the block need to only have 1 star per block? Does the star need to go to the edges, or can it be framed or off-center? Kristin, I'm glad that I may have lured you back into my web in time for Halloween. Q: Does the block need to only have 1 star per block? A: Yes. Since we're going completely scrappy on fabrics, let's keep some things constant among our blocks. Q: Does the star need to go to the edges, or can it be framed or off-center? A: Yes, No and Yes. Let's try to avoid framing too small blocks. If you're worried your block will come out too small, start with slightly larger squares. That said, you CAN make an off-center block, as long as it has a 9-patch construction and reads like a variable star. I have an idea for an easy way to make off-center liberated variable blocks and plan to share it as soon as I find the time … yes, I am playing a bit of catch-up with the lotto right now. Hey everyone … June just let me know that there were some extra spaces in my pattern links and they weren't working. I've edited the links and they are all better now.